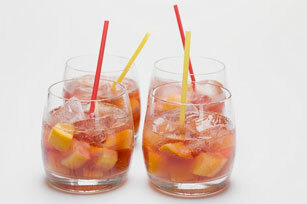 No wine or brandy required for this party-perfect sangria! It's made with club soda and lemonade flavour drink mix and served with chopped mixed fruit. Add club soda to drink mix in 3-L plastic or glass pitcher; stir until mix is dissolved. Serve over ice; top with fruit. Top each serving with 1 Tbsp. cranberry juice. Remove orange and lemon rind before chopping.